Olea & Viorica One of the things I really enjoy doing is going with team members to visit their home church in a village of Moldova. One never knows quite what to expect. The churches are various sizes and locations and styles and atmospheres. Today I went with Matthew and a translator to visit a Russian-speaking church in Transnistria, the Russian enclave of Moldova that declares itself autonomous. So to get there you have to cross their border, even though it's not a "real" country that is recognized by anyone else. Anyway, one of our team members is from a church in that area. She is one of 4 girls we are preparing to go on a short-term mission this summer to Central Asia. She shared her testimony and about the mission trip she is going on. 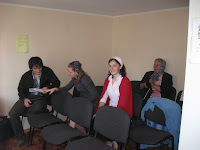 Matthew preached in English and was translated into Russian. It was quite a large church and the service lasted for at least 2 1/2 hours, full of everything including prayer, testimonies, poetry, an accordion solo, a couple sermons, and a baby dedication! I was glad that Olea was sitting with me translating into Romanian from Russian for me so I could understand what was happening. On the way home she mentioned that her purse was full of money that people kept handing her to help provide for her mission trip. Interesting side note: much of the money is Transnistrian currency which is only useful in this tiny self-declared nation. She'll have to get it changed within Transnistria I believe. 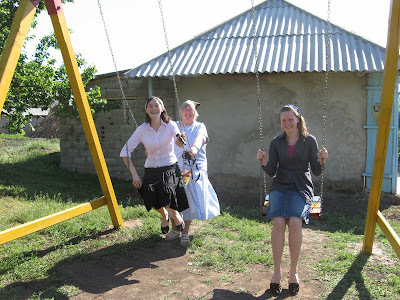 A few weeks ago I travelled with Lilian and Olea and Viorica to visit Viorica's tiny church. Let me share with you the typical visit to a village church. 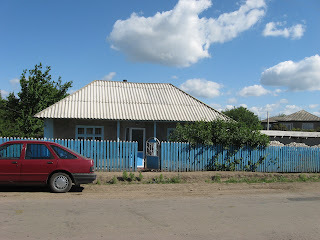 We usually leave from Chisinau anywhere from 7 - 8.30 a.m., depending on how far we will have to travel and what time the worship service begins. Most services begin at 10 but some start at 9 a.m. We were going in my car, which technically is registered in Lilian's name so he did the driving. That was good, because he knew the way! As we were travelling I asked Viorica about her church, wondering how large it is and how many members. She told me there were about 7 or 8 members so I knew it would be a small church. But when we arrived it was so small that I didn't even recognize it as a church! But from this tiny building the Christians in the community host a daily feeding program for poor children of the village. The pastor and some other members do outreaches and programs to help children in nearby villages as well. I'm telling you - the churches here are committed to care, no matter how large or small they are. And sometimes it is the tiny ones that seem to care the most. Once we arrived, we made our visits to the little building in back of the church (no indoor plumbing in most villages, you understand). We checked out the playground that had been built by one of our summer teams for the benefit of the community. Eventually the church members arrived and between us and them, we filled all the seats in the tiny church. In fact, we took up almost half the chairs!! After a time of singing, Viorica shared a testimony of how God is working in her life and how she feels called to go on this short-term mission to Central Asia. She showed some photos of the work she has been doing as a member of our team. For a while she had worked in another village in one of our local ministry teams. 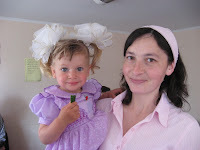 More recently she has been serving our team in Chisinau by coordinating the meals at our mission base. The church prayed for her. Then Lilian was invited to preach, one of the women recited a poem, and the pastor also preached. I was given an opportunity to say something about Viorica and the work of our team and the mission she will be going on. 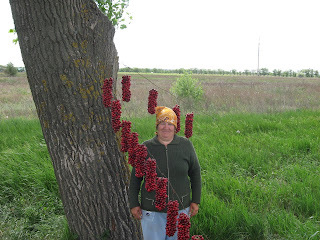 (In most churches in Moldova women are permitted to recite poetry, share a testimony, or sing, but not to preach. The fact that I am a pastor is not widely known among our ministry partners here.) The service ended by around noon - a typical 2-hour service. Typically after a worship service in a village guests are either invited to someone's home for a meal or are served lunch at the church by the women of the church. In this case they just moved the chairs back, set up the table and a feast appeared before us. The food is always good and always plentiful and it gives a great opportunity to get to know the pastor, his family and whoever else is staying for the table fellowship. 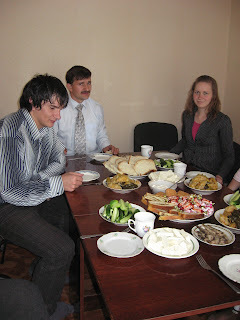 Usually at some point, often after the meal is over, we as leaders would meet more privately with the pastor to have a conversation about our partnership and any questions they may have; and to share information about the work and future plans of their church member who is serving with us. After our meal at the church, as sometimes happens, we made a stop at Viorica's home. This gave us a chance to meet her family and to see her home. Only one of her sisters is a Christian believer so we hadn't met her mother or other family members at church. They offered us tea and sweets and we had a chance to visit a bit, to see what animals they had in their yard and Viorica had time to obtain the home-made food that Moldovans generally take back from a visit to the homestead: brinza (cheese), compote (a fruit drink), preserves and whatever fresh fruits and vegetables are in season. At this time it was cherry season and on the way home we stopped so I could buy cherries just because I wanted to see how they put them together as they do to sell them by the roadside. And because I wanted to eat them!! 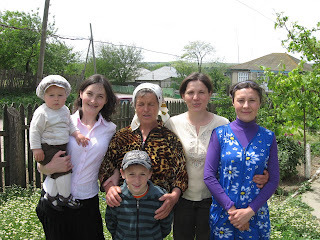 I always come home from these visits feeling blessed, full, and more aware of the way of life in Moldova. Always we have been so welcomed and so well treated. Moldovans are some of the most hospitable people I know. Posted by Barb at 6:39 p.m. I always enjoy your blog. You have wonderful pictures and enjoyable entries. I believe you communicate the Moldovan culture wonderfully. I'm not sure you will remember me, but I am the person that met you at Holy Trinity saying I had read your blog. This was one year ago. My family et al. will return in July to assist in the EFNL ministry as we did last year. Should we meet again, I will say hello.